Manufacturer of a wide range of products which include fujikura splicing machine 62cplus. Core to core alignment splicer. The Fujikura 62C+ with bluetooth provides active core alignment splice loss performance while utilizing a conventional wind protector and tube heater design. 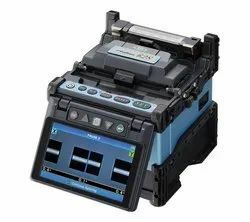 An alternative to the fully automated core-alignment model 70S, the 62S includes an auto-start feature for both the splicing and tube heating process that minimizes the steps necessary to process splices. With a shrink time of 23 seconds with standard splice sleeves, the 62S ensures a high level of productivity. Incorporating the proven ruggedized features pioneeredby Fujikura, durability is greatly enhanced by a mirrorless optical system and "severeimpact resistant" monitor. Battery capacity is 200 splices/shrinks. The transit case doubles as a built-in or mobile workstation and makes splicing easier than ever.